No more Death March to London Pass today, as the pass is now expired; however, we still had one more pair of Zone 1-6 Travelcards, and we made full use of it traveling out to Epping at the far end of the Central Line, where we rode the Epping-Ongar Railway, a heritage railway running on the route of the former London Underground branch to Ongar from Epping. After breakfast, we walked to London Bridge station, going into the Borough Market and getting another couple of scoops of ice cream from The Greedy Goat that we'd discovered yesterday after our visit to the Old Operating Theatre. Lisa says they make the best ice cream she's ever tasted. Yesterday, the Central Line was shut down by a 24-hour transit workers strike, but there was normal service today, so we set out on the Jubilee Line (nearest to our hotel) and went to Stratford, where we changed to the Central Line. The train on the right is the Jubilee Line train on which we came to Stratford. The Central line extends out into the Essex countryside, running on the surface. It's quite a contrast from the hustle and bustle of London proper. 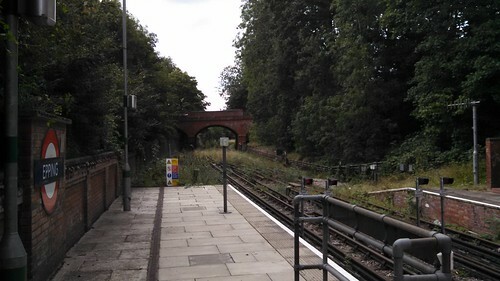 This is the end of the existing Underground line at Epping. 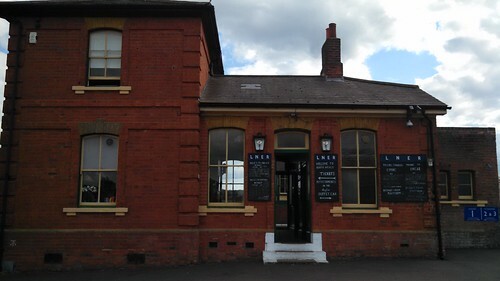 The tracks continue on to North Weald and Ongar, but there is no direct rail connection between Epping and the Epping-Ongar Railway. 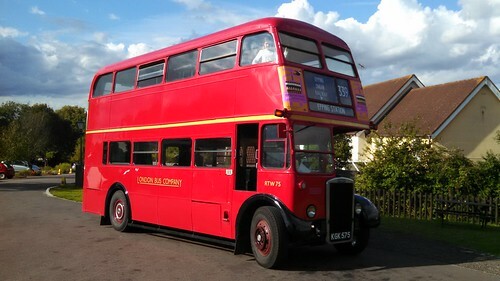 A restored heritage bus (this one's photo from later that day) runs a route between Epping and the North Weald station of the EOR, including intermediate stops in Epping such as North Weald Airfield. Lisa and I rode on top. The conductor sells the combined bus-rail package of GBP13 each (GBP12 if purchased online in advance, which we did not do). 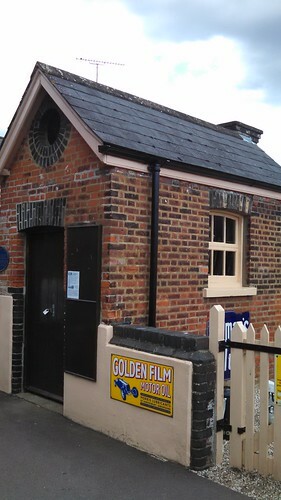 After the short bus ride, we were delivered to North Weald station. 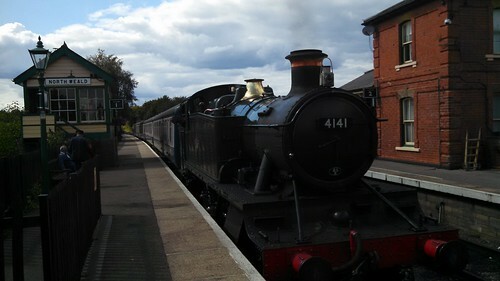 I had time to get a coffee from the EOR cafe before heading over to Platform 1 to catch the train to Ongar, pulled by locomotive 4141. After a pleasant ride through the countryside, we arrived at Ongar. I somehow forgot to take a picture of the station itself, but did take this picture of the "warming hut" where hot stones were once prepared to heat the feet of travelers to London departing from here. Lisa and I walked into Chipping Ongar's High Street, described as "a stone's throw" from the station. This description is a bit optimistic; worse, Lisa is not walking well, after the huge amount of walking we've done the past few days. She's limping badly, to the point where I feared that I was going to need to get her a wheelchair. Adding insult to injury, all of the places that seemed to be serving food we might have wanted to eat closed at 15:00. We ended up getting bread and lunchmeat from a grocery store and making sandwiches on the ride back to North Weald. We rode an EOR's diesel multiple unit set from Ongar back to North Weald, and then on to a short turn to the current end of operations at Coopersale in the Epping Forest and back. Having slept in this morning, we were only able to make the one trip on the line, and planned to catch the last bus back to Epping at 17:00; however, I did get this one chance to photograph the mechanical signal box at North Weald before Lisa called out "the bus is here!" and I hurried across the level crossing to catch our ride home. Rain started to fall just as we boarded the LU service from Epping, and we were already tired thanks to insufficient sleep. The ride inward passed uneventfully. Lisa had the idea that we could make better use of our Travelcards and explore parts of the network over which we'd never ridden. We transferred at Stratford to the London Overground (conventional heavy rail). The Overground is relatively new, being a consolidation and rebuilding of London regional surface rail routes to form, among other things, a new orbital rail route around the city. At Highbury & Islington, we transferred to the Victoria Line, which we rode to King's Cross. There, we wandered a bit away from the station and found a place where we had a decent lamb dinner. Going back to King's Cross, we headed toward Paddington on the Hammersmith & City Line, but we could see something was wrong as the next train crawled into the station. 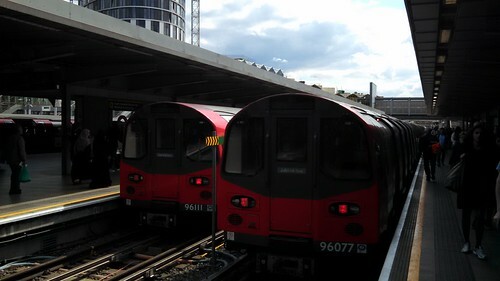 There apparently was a major signaling failure here, and trains were being pulled from service, but we managed to ride to Baker Street anyway. 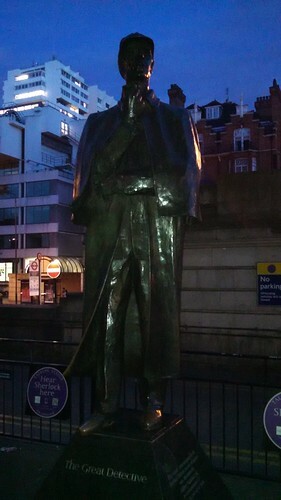 We didn't actually mean to get off at Baker Street, but since we were there anyway and were on an unlimited-use Travelcard, we left the station for a short time. 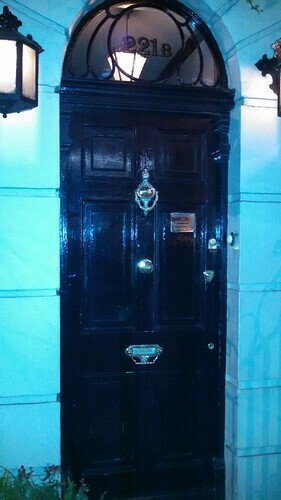 Here at 221b Baker Street is the Sherlock Homes Museum. Yes, of course there wasn't actually a 221 (let alone a 221b) in Baker Street during the period of time when Homes was said to have lived there, but this is all good fun anyway. I snapped this photo. 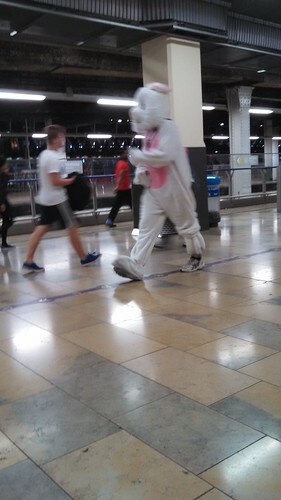 Shortly later, Lisa came out of the toilets and I said, "I just saw a giant rabbit walking down the concourse." She looked at me funny. "Have you been sniffing too many diesel fumes?" I produced the photo to prove I wasn't hallucinating. Lisa agreed that I couldn't have created that photo so quickly. Still, maybe this was a sign that we should head back to the barn for the night. We returned to the hotel via the Bakerloo and Jubilee lines. Lisa somehow managed to make it back to the hotel despite her painful feet. 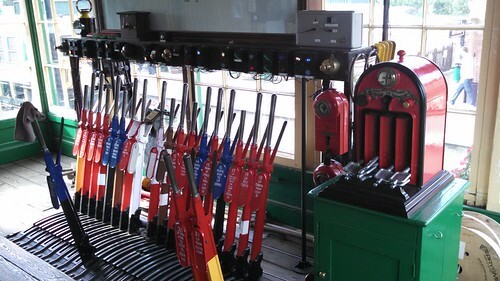 We did cut back a little bit over yesterday: only about 17,500 steps thanks to spending lots of the day riding trains. We mostly had fun, and we didn't work as hard as we did trying to bolt down an all-you-can-eat menu of museums and attractions the previous three days. Tomorrow is our last fully free tourism day because Monday we move out to Heathrow to anticipate the trip back to the USA.